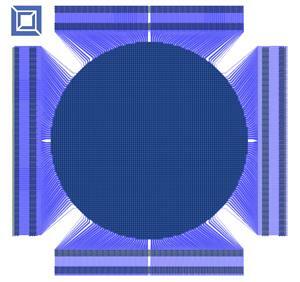 CAMBRIDGE, Mass., Oct. 10, 2018 — Boston Micromachines Corporation (BMC), a leading provider of MEMS-based deformable mirror (DM) products for adaptive optics systems, announced that it has successfully delivered the world’s first fully-functioning 2040 element MEMS deformable mirror as part of a NASA Phase II Small Business Innovation Research Program (SBIR) contract, monitored by NASA’s Jet Propulsion Laboratory (JPL), to develop DM technology needed for exo-planet imaging on the next generation space-based telescopes. In addition, the NASA SBIR Program has extended the contract through its Phase II-X program to have BMC deliver additional devices for evaluation and potential inclusion in the Wide Field Infrared Survey Telescope (WFIRST) program. The II-X is jointly funded by NASA SBIR and by WFIRST. About Boston Micromachines Corporation Founded in 1999, Boston Micromachines Corporation (BMC) is the leading provider of microelectromechanical systems (MEMS) – based mirror products and a designer of adaptive optics instrumentation as well as advanced retinal imaging instrumentation. By applying wavefront correction to produce high resolution images, BMC devices can be used to enhance images blurred by the earth’s atmosphere as well as for imaging biological tissue and the human retina. They are widely used to drive scientific discovery in astronomy, laser beam shaping, microscopy, vision science, and support a variety of defense applications. Customers include NASA, UC Berkeley, Lockheed Martin and Boston University. Located in Cambridge, MA, BMC is privately held and offers custom-designed manufacturing services in addition to its portfolio of standard DM products. For more information on BMC, please visit www.bostonmicromachines.com.